Molly and I had such a great time at the Golden Eagles reunion (Early & Pioneer Naval Aviators Association) at the Lansdowne Resort in Leesburg, VA. The Golden Eagles are an elite organization of Navy, Marine and Coast Guard aviators, Medal of Honor recipients, astronauts, fighter aces and others who have contributed significantly to U.S. 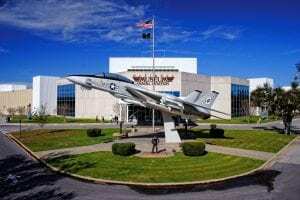 Naval Aviation. It is such a privilege to serve and be with the likes of GEN (Ret) James Amos, LGEN (Ret) Fred McCorkle, ADM (Ret) Joseph Prueher, ADM (Ret) Ronald Zlatoper, former NASA Administrator Charles Bolden, and many other distinguished Americans. A few, such as ADM (Ret) “Zap” Zlatoper, we’d seen recently in Norfolk at the A-6 Intruder Association reunion. I was astonished to realize that Zap’s wife, Barry Oliver Zlatoper, was my babysitter as a child – SMALL WORLD! 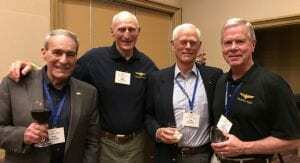 – which got even smaller upon meeting RADM (Ret) James Flatley and wife Nancy, along with CAPT (Ret) Warren Christie and wife Joan, all of whom lived in my childhood neighborhood of Larchmont. The photo here depicts this “reunion within a reunion” with Molly and me, the Zlapaters, and the Christies. 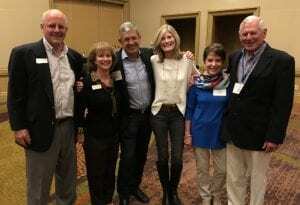 We can’t wait to renew friendships at the Ft. Worth Golden Eagles reunion in 2019. Molly will be with her friend Charlie Bolden again next week at the Marine Corps Aviation Association’s Annual Symposium in San Diego and then again in June in Washington DC with the Service Academies Global Summit. Our Featured Veteran this month is Rob Gordon, a graduate of West Point and a driving force behind the Service Academies Global Summit, “a gathering of proven leaders from around the world from all sectors – government, business, military and NGO/nonprofit – to strengthen shared bonds and help each other become better leaders and members of society”. Rob served as aide-de-camp to Gen. Colin Powell and as the Deputy Under Secretary of Defense for Military Community and Family Policy in the Obama Administration. AFR is proud to be planning the 2nd annual stateside Summit in our nation’s capital this June. The Top Destination this month is Albuquerque, New Mexico’s largest city and year-round hot air ballooning capital of the world. From rich cultural heritage, to breathtaking mountain views, to unforgettable local cuisine, Albuquerque is certain to take your next reunion to new heights. 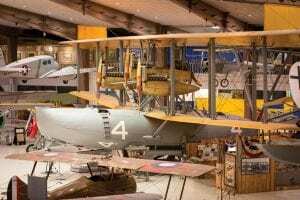 The Must-See Museum this month is the National Naval Aviation Museum, the world’s largest naval aviation museum, with more than 150 beautifully restored aircraft representing Navy, Marine Corps, and Coast Guard Aviation. This year’s SAGS https://serviceacademiesglobalsummit.com/ will be held June 13-15, 2018 in Washington DC at the Renaissance Arlington Capital View. More than 500 alumni from the alma maters of presidents, astronauts, generals, and admirals will gather in June for a meeting of the minds at the 4th Annual U.S. Service Academies Global Summit (SAGS), where all five academy superintendents will be in attendance. Noted speakers include The Honorable Charles Bolden (USNA ’68), 12th Administrator of NASA, retired Marine Corps Major General and NASA astronaut, GEN (Ret) Stanley McChrystal, President of the McChrystal Group and former commander of the Joint Special Operations Command in Iraq from 2003-2008, and The Honorable Robert A. McDonald (USMA ’75), 8th U.S. Secretary of Veterans Affairs, retired Chairman, President and CEO of Procter & Gamble. Gordon is Chief Global Officer of Connected Living, a services and technology company that forges family, community and employee connections, and for months has been volunteering his talents and time organizing SAGS. “My military and public service have taught me many leadership, management and organization skills that flow directly to ethics I carry through life and also in support of SAGS,” said Gordon who lives in Reston, Virginia with his wife Millie. 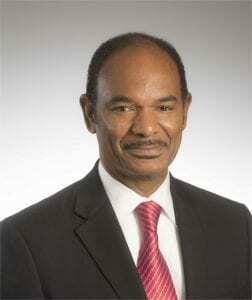 Third generation Army and a 1979 West Point graduate, Gordon served 26 years before retiring in 2006. He was also aide-de-camp to General Colin Powell and Special Assistant to the Secretary of Veterans Affairs in the first Bush Administration. Gordon spearheaded the creation of DOD’s Military Spouse Employment Partnership initiative with Fortune 500 companies and other partners that have provided jobs to more than 100,000 military spouses. He is a recipient of the Secretary of Defense Medal for Outstanding Public Service, holds a Master of Public Administration from Princeton and received the university’s Edward P. Bullard Distinguished Alumnus Award. In 2017 he received the Franklin Award by the National Conference on Citizenship. Albuquerque is New Mexico’s largest city, and year-round hot air ballooning capital of the world. Your group will have the opportunity to experience centuries old cultural traditions, 310 days or more of soul-warming sunshine, and authentic cuisine that you can’t find anywhere else. With a wide variety of Albuquerque hotels and meeting spaces that can accommodate groups that range anywhere from 25 to 700 attendees, you’re sure to find a perfect fit for your reunion with any budget. 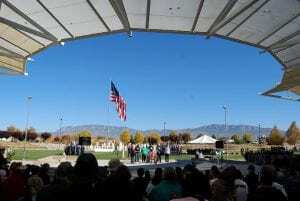 Visit the 25 beautiful acres of the New Mexico Veterans’ Memorial where you can explore the property’s museum, library, and join together in one of their top-notch meeting facilities. This space serves to remember and honor the many veterans of New Mexico and beyond. 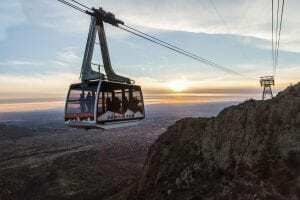 Soar through the Sandia Mountains all the way to 10,000 feet on the Sandia Peak Aerial Tramway. Once you reach the top, you’ll discover a perfect view of Albuquerque’s famous sunsets along with the sweeping city itself. Witness a centuries-old Native American dance at the Indian Pueblo Cultural Center, pulsing to the beat of a heartfelt drum. In Albuquerque, each of your cultural curiosities will find a home. Taste an authentic New Mexican plate of enchiladas, smothered in red and green chile, and wash it down with a local craft beer from a booming brewing scene that will leave you impressed and refreshed. Not a beer drinker? You’re in luck. New Mexico’s wineries make up the nation’s oldest wine producing region. From rich cultural heritage, to breathtaking mountain views, to unforgettable local cuisine, Albuquerque is certain to take your next reunion to new heights. They are biplanes of the Great War, record-setters, experimental platforms and survivors of epic aerial battles. In service they splashed through Pacific swells, slammed down on the pitching decks of aircraft carriers, flew through hails of gunfire and blasted to the stars. The beautifully restored aircraft include rare and one-of-a-kind flying machines such as the NC-4 (first to cross the Atlanti c by air), SBD Dauntless Bureau Number 2106 (a veteran of the Battle of Midway), the Que Sera Sera (first aircraft to land at the South Pole), the last combat F-14D Tomcat, and many, many more. The Museum’s exhibits provide a closer look at people and events that shaped our history, from vintage uniforms and historic documents displayed in brilliant mahogany display cases, to dioramas that transport visitors to the World War I Western Front, Main Street U.S.A. in 1943, and the depths of Lake Michigan. Each represents a chapter of that story, with stirring tales of combat, scientific discovery, technological achievement, and triumphs of the human spirit.